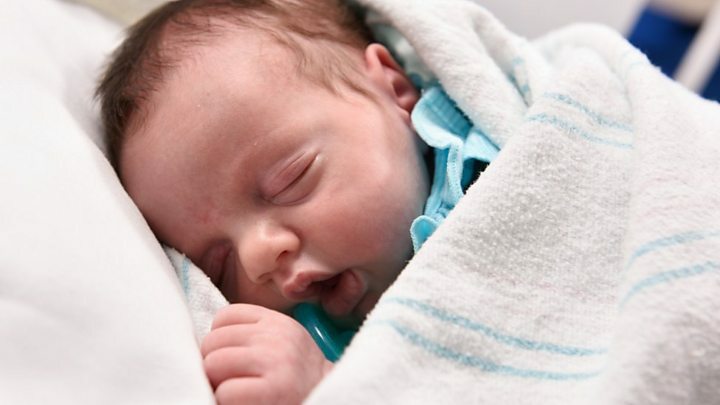 A baby girl from Lewisville, Texas, has been "born" twice after she was taken out of her mother's womb for 20 minutes for life-saving surgery. At 16 weeks pregnant, Margaret Hawkins Boemer discovered her daughter, Lynlee Hope, had a tumour on her spine. The mass, known as a sacrococcygeal teratoma, was diverting blood from the foetus - raising the risk of fatal heart failure. Baby Lynlee weighed just 1lb 3oz (0.53kg) when surgeons opened the womb. Mrs Boemer had originally been expecting twins, but lost one of her babies before the second trimester. She was initially advised to terminate her pregnancy entirely before doctors at Texas Children's Fetal Center suggested the risky surgery. The tumour and the unborn baby were almost the same size by the time the operation was performed. Lynlee was given a 50% chance of survival. Mrs Boemer told CNN: "At 23 weeks, the tumour was shutting her heart down and causing her to go into cardiac failure, so it was a choice of allowing the tumour to take over her body or giving her a chance at life. Doctor Darrell Cass of Texas Children's Fetal Centre was one of the team who carried out the surgery. He said the tumour had been so large that a "huge" incision was required to reach it, leaving the baby "hanging out in the air". Lynlee's heart virtually stopped during the procedure but a heart specialist kept her alive while most of the tumour was removed, he added. The team then placed her back in her mother's womb and sewed her uterus up. Mrs Boemer spent the next 12 weeks on bedrest, and Lynlee entered the world for the second time on 6 June. She was born via Caesarean at almost full term, weighing 5Ib and 5oz, and named after both of her grandmothers. When Lynlee was eight days old, a further operation helped remove the rest of the tumour from her tailbone. Dr Cass said the baby girl was now home and thriving. "Baby Boemer is still an infant but is doing beautiful," he confirmed. Sacrococcygeal teratoma is a rare form of tumour seen in one out of 30,000-70,000 live births. Its cause is unknown but baby girls are affected four times more often than boys.